A joy to be working with Sylvester McCoy again. The last time we worked together was at the RSC in 2001 with him playing a beaver and me a mermaid. 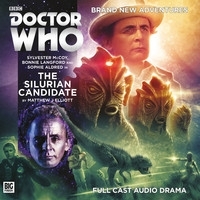 This time he’s the Doctor and I’m the Director of the Eastern Bloc as the world teeters towards nuclear holocaust – unbeknownst to us that there’s a bigger threat from the Silurians. It was a pleasure to become part of the Dr Who story and to be welcomed into the Big Finish family.